The hills surrounding Edinburgh are gorgeous. In the few months I've been travelling, I've completely completely realized how in love I am with mountains and hills. (And though I'm in Europe, I often find myself longing to travel Alberta/British Columbia). On the very left in the picture below, you can see the Palace of Holyroodhouse, the Scottish Parliament building. 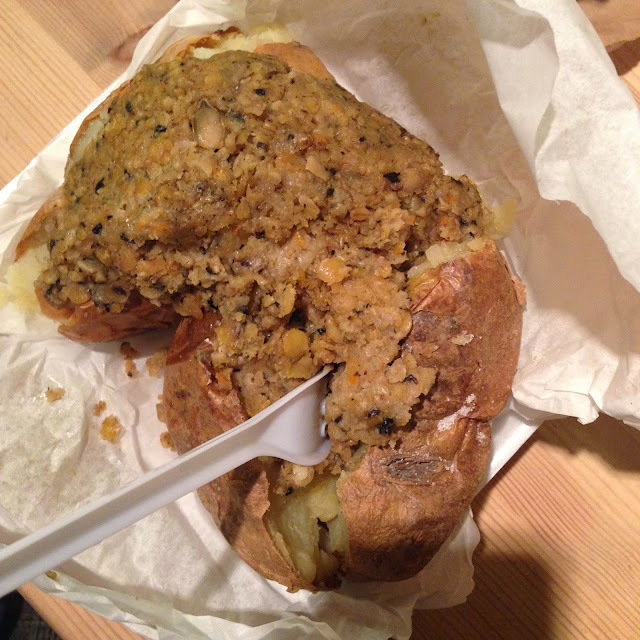 The rest of the day, I wandered around Edinburgh and then went back to the Baked Potato Shop for VEGTARIAN HAGGIS on a potato. It doesn't look super appetizing, but it was delicious. Copied from a website: "Macsween vegetarian haggis contains a hearty mix of kidney beans, lentils, nuts, vegetables, oatmeal, onions, seasoning and spices." Honestly, some of my friends tried real haggis and didn't love it - but I would absolutely recommend this glob of yumminess to everyone. On Wednesday night, Jessica and I (she's shown in the instagram post I made about this) went to Forest Cafe! Here's their description from their website: "The Forest is a volunteer-run, collectively-owned, free arts and events project. We run a vegetarian café and a big block of studios and facilities to provide dedicated space for people to get involved in any creative activity imaginable." I can't really sum it up better than that - but it was a lovely place. On Wednesday, we headed out of Edinburgh (boo...) and slowly made our way to Liverpool. 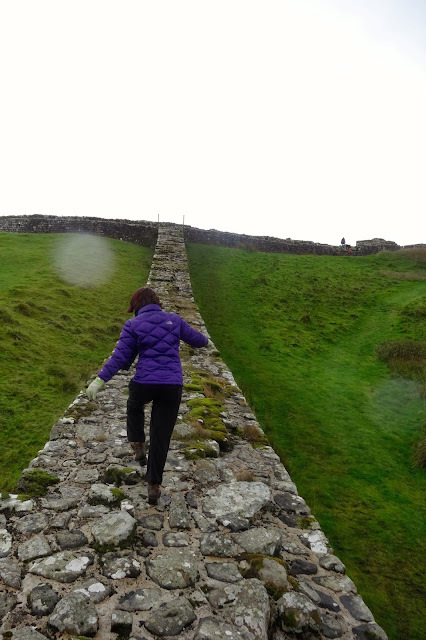 Our major stop along the way was Hadrian's Wall - a defensive fortification in Roman Britain. Emperor Hadrian built it in 122 AD, and a lot of it is still somewhat standing. There were also lots of sheep strolling around. When we finally arrived in Liverpool on Wednesday evening (like 5pm, so it was sunny out for an hour! ), we found our way to Chinatown and had a cute dinner. This was some pretty architecture along the way. Albert's Dock, which is one of the main docks of Liverpool, was beautiful at night. I actually found it to be prettier during the daytime though - so those pictures are below. On Thursday morning, I had a field study for my Development course to the International Slavery Museum. It was a pretty powerful museum, and though there wasn't very much information, I did enjoy learning about the remnants of slavery still displayed in the architecture/history of Liverpool. I spent a lot of time in one particular area focusing on modern slavery and cotton picking in Uzbekistan. After the International Slavery Museum, my friend Asheika and I went to "The Brink" for lunch. Essentially, "the Brink is a recovery social enterprise, which means that all our profits go directly back into the community to fund support for those who have suffered through alcoholism and addiction." They don't have any alcohol on site, which is awesome considering they have a good night life scene (though we wouldn't know from experience because lunch); their menu is based of local ingredients. I thoroughly enjoyed it here. After lunch, we went on a very quick two hour mission around Liverpool! This is Albert Dock during the daytime. This is the World Museum in Liverpool (I think... I didn't actually go in). This is the Cavern Club - where the Beatles first played! There was so many Beatles tourist attractions in Liverpool, and some of y'all will hate me for saying this, but I wasn't super interested in finding Penny Lane or Strawberry Fields or whatever else... The Cavern Club was cool though. We then headed back from Liverpool to the castle Thursday afternoon to night; there was lots of movie watching on the way - V for Vendetta, Pitch Perfect! I bought a cucumber at one of our rest stops (while the majority of students bought Burger King haha) and just munched on it. It was delicious and I genuinely miss being able to go into my kitchen fridge and eating whatever I want. So there, that was my Midterm Trip! On Friday, I went into Brighton to see Ender's Game!!!!! It came out on Oct 25th in the UK but it's still not out in Canada haha. I won't say anything regarding the movie because some of my friends have expressed threats if I do mention any spoilers (kidding, sort of)... but it was well worth a watch! If you have small children, it might be kind of scary to see the attacking monster-like species. I also got a lovely shot of Brighton's burnt down pier thing before I left. Sometimes I regret going into Brighton because I just spend money on cupcakes oh my goodness delicious but then things like this happen and I realize how much I LOVE the city. I really really feel trapped sometimes because we're in the middle of nowhere at the castle... The travelling is good though! Class today (Monday) was weird because we hadn't had class for a week and a half... I'm excited to get this week over with; I'm going to Shared Planet 2013 in London this weekend AND I'M SO EXCITED. It's the UK's biggest student conference (300+ students?) on environmentalism and human rights. Everyone there will be 16+, and I've been DYING to meet actual British people. This fake exchange thing is a little off putting at times; being around Canadians 99% of the time makes it hard to feel like I'm living in Britain for so long (2 months down, 6 to go).